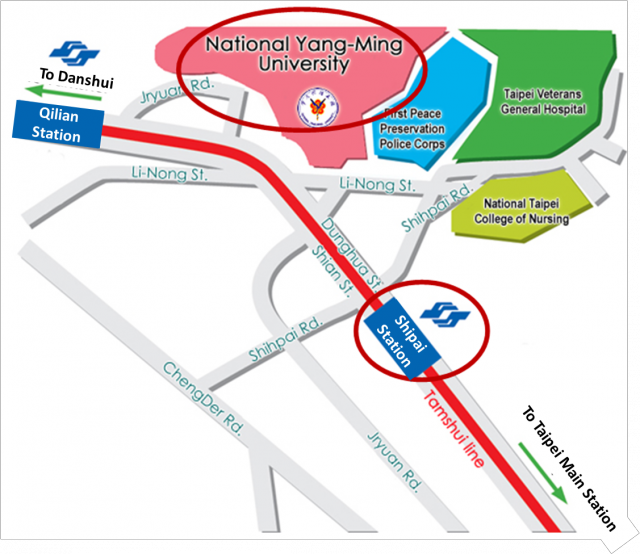 As we are located on a slope, a shuttle bus runs regularly between our school, VGH and Shipai MRT Station for the convenience of faculty and students. For local transportation, you can take the Danshui Line of Taipei MRT or city buses (more than 10 routes) to and from our school. It’s every 5-10 minutes per shuttle bus in rush hour (from7:10-8:15, 9:30-10:00 and 17:00-18:00), and every 15 minutes per shuttle bus in normal hour. The closest stop to the venue is the main entrance of NYMU. Forty five minute before the conference, a free bus service will start to operate for 1.5 hours. The minibus will leave the MRT Shipai station for the activity center every 10 minutes or sooner if the bus is full.